Nigeria forward, Alex Iwobi was in top form on Thursday as Arsenal got their preseason campaign off to a flying start; beating Sydney FC 2-0. 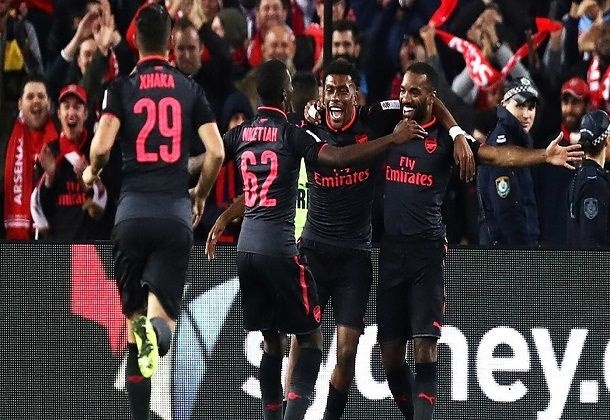 In the game played at the ANZ Stadium in Sydney, Iwobi set up one of the goals for Arsenal as record signing Alexandre Lacazette marked his unofficial debut for the Gunners with a goal in their 2-0 win. Iwobi started from the bench. He was introduced in the 68th minute for Mesut Ozil as Lacazette also made his entry. Arsenal went 1-0 up in the fourth minute through skipper Per Mertesacker with an acrobatic finish. LACAZETTE SCORES ON DEBUT! ARSENAL FANS GO GAGA! Arsenal had the chance to double their lead in the second half but Danny Welbeck’s penalty was saved after it had been wrongly awarded for handball when the ball indeed hit the Sydney FC defender’s back. In the 84th minute, Lacazette who replaced Welbeck on 68 minutes, scored his first Arsenal goal, tapping home from Iwobi’s low cross from the right. Arsenal’s next pre-season game comes up on Saturday against Western Sydney Wanderers also in Australia.